Thomas Magee awoke on the bench, bewildered. The dampness of the early autumn morning hung in the fog, needling its chilly tentacles into every pore on his body. The salty sea air curled into his mouth with each breath. He sat up clamoring through his thoughts to remember the night before. Memories slipped into the distance as if he was racing into the fog to catch the misty air itself. Fragments of images snickered at him from the edge of his consciousness, begging him to give chase and then disappearing into the mist when he did. He sat up, massaging the stiff muscles in his neck. He cupped his hand before his mouth, breathing out and quickly inhaling through his nose — the stench of too much whiskey and beer mingled with the odor of stale morning breath. The sun stabbed at the moist air sending its shafts of light through the retreating defenses of the night. Torment stabbed into Thomas’ heart. He knew where he was. Julia first ran her fingers through his hair, sitting on this very bench. They shared a first kiss that ignited a passion consuming every emotion and spawning a week spent wrapped in each other’s arms — the days and nights aflame with ecstasy and affection. But then it all ended. She was gone. Authorities grilled him for hours on end, watched his every move for weeks, and picked his life apart. A year later, he still flinched when someone knocked hard on his door, expecting to be hauled away for another round in a dank interrogation room. Her disappearance captivated the local press and drew whispers in the shadows wherever he walked. The fog rippled and battled with itself as the morning breeze tangled with the tall grass of the cliff. Glimpses of the ocean appeared and disappeared far below the bluff as Thomas rose from the bench. 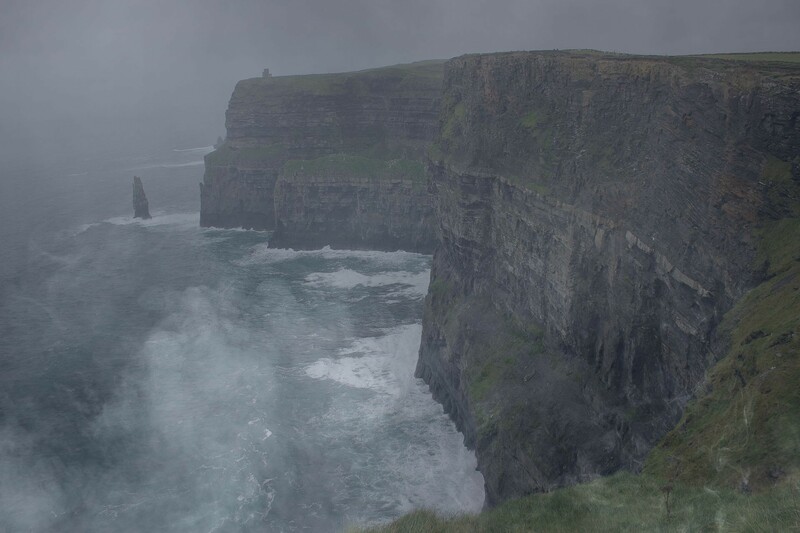 He walked to the edge, peering down to watch the tide pounding its way back to the base of the cliff, wrapping its watery arms around the rock formations far below. Off in the distance, snuggled against the sea, he could see the town he once called home. Perhaps, today would be the day he declared his freedom and left forever. The sunlight broke through the morning clouds, and the seabirds floated through the rays appearing as angels before plummeting toward the sea. Back home he walked, knowing that today would not be the day that he fled from the disparaging glances and silent accusations of his neighbors because today might be the day that she returned. Another day passed him by in a blur. Evening found him again mounting the stool in the corner of the pub. He was always a loner but was more alone now than before — an insect at the edge of a picnic, hoping to steal a morsel of food, but fearing the hand that would smash him should he try. The barkeep set his drink on the bar, and Thomas stared into the golden liquid. The hands on the clock strained to make their appointed rotations while the partons came and went. One glass became two, and two became four. “It’s time for you to go,” stated the barkeep. The words hung in the air, waiting for recognition, but receiving nothing more than the chiming of the small bell that hung above the door as he left. The door closed behind him, and he walked into another foggy night. Misty formations inched across the narrow sidewalk. Thomas closed his eyes, wishing the night would take him forever into its icy embrace. It was her again. He knew it. “Julia,” he cried into the shadows. The words faded as he chased them down the cobblestone street. “Julia,” he cried again staggering in the direction of the sound, passing the homes filled with inhabitants dreaming fantastic stories devoid of the loneliness that consumed his days and nights. From the dark alley, he heard the faint calling of his name again. The iron bars of the tall fence at the end of the alley knocked against his hands as he groped his way in the pitch black. The voice was closer now, just beyond his sight on the other side of the fence. “Will you leave and come with me forever?” inquired the tender voice. “Yes,” replied Thomas without hesitation. “Why?” he asked into the growing silence. A chilly, damp wind brushed across his face as he waited for a reply that never came. Thomas’ heart pounded harder and harder as he trekked his way out of the village and up the long winding trail to the highest point for miles. He could hear the waves crashing on the rocks below, but the darkness and creeping fog constricted his sight. “Julia,” he cried out when he reached the bench. Silence replied with another surge of thick, murky fog clawing itself up from the edge of the cliff to embrace everything in its clammy grip. “Julia,” he pleaded with the darkness, wondering if his sanity abandoned him as she had done. “Thomas,” came the reply from the black depth of the fog as if it was harkening from the waves beating the rocks below. His eyes strained toward the ocean as he stepped closer and closer to the boundary that separated the grass and rocks of the high landing from the sheer drop into the sea. “Thomas,” the voice moaned again. As Thomas peered toward the ocean, her face began to materialize from the fog. She drifted toward her lover, extending her hand and brushing it gently across his cheek. “With me forever,” she softly chanted, her body appearing and wrapping her arms around his neck. Icey spikes of terror stabbed into Thomas’ lungs as he drew in a breath and looked into the eyes of his lover. A shiver pulsated deeper and deeper into his body with each heartbeat, freezing his mind and body in place. “With me forever,” the apparition repeated, pulling itself close, kissing his ear, and casting his mind into a frozen wasteland. Needles like ice pricked his skin as she moved behind him, never releasing her hold. “With me forever,” she whispered into his ear as he felt the needles growing into icicles, plunging themselves into his flesh, splitting open his body and casting his soul further into that unknown icy domain. “Thomas, Thomas, Thomas,” the masculine voice yelled from a distance. Thomas knew the voice, but his lips refused to respond. Cold winds continued to whip through his spirit, ripping chunks of his fragile hold on reality away. His body turned and moved in the direction of the approaching man. He saw Harry Wright approaching the bench, struggling to see through the soupy fog that bubbled through the air. Thomas felt the air move through his nostrils and into his lungs. His lips parted, and words began to form, pushed forth from his mouth, but not of his thoughts. “I am here,” came the words out of his mouth in the soft, gentle voice of Julia. He stretched out his hands and began to walk toward Harry. Thomas stared at the hands that extended from his body. Rather than large hands worn rough by hard labor, he saw the delicate, slender hands of his lover. Harry began to back away as Thomas approached. A haunting sound began to fill the air as a dark waltz began to play, far away, carried by the mist. “Do you not remember me?” flowed the gentle words from Thomas’ mouth spoken by the woman long gone. Thomas felt his hand graze across the stubbly beard of Harry’s face. His other hand pressed along Harry’s waist pulling him close. “You found me here alone,” spoke the soft woman’s voice. A foreshadowing dread of what might happen next seeped into Thomas’ thoughts. The cold wind battered his soul in its dark isolation, tearing him between oblivion and the present moment. Thomas watched the feminine hand at the end of his wrist slipping from Harry’s face, tracing a path down his shoulder, and sliding his fingers into the other man’s hand. “You can’t be real,” begged Harry as Thomas stepped forward, leading Harry as their dance began. Heavy strings joined the bells and piano in the waltz, and Thomas’ body picked up the tempo, leading Harry harder, forcing him to follow in the dance. Thomas felt the nausea crash across the icy landscape where his soul battled against a torrent of frozen pressure that increased his grip on the man who stared into his eyes but saw Julia’s. Thomas peered through the frozen flecks of ice carried by the wind holding his soul captive and gazed deep into Harry’s eyes. Anger and hatred flared as the captive man fought against each step in the waltz. A sudden thaw tore back the arctic wasteland holding Thomas’ soul as he relinquished any defense in the battle with the spirit possessing him. Harry struggled harder against each movement, but Thomas felt the warmth of Julia flowing within him. Her body felt naked against him exactly like it did in the nights they spent together. Thomas pushed the man closer to the cliff’s edge with each stroke of the violin. Their dance ended as the couple stepped into the open air above the ocean. Thomas pushed his screaming partner away as the air rush faster and faster past them. He closed his eyes and saw Julia. She smiled, her delicate, beautiful features bathed in the eerie glow of the night.